See those chips? They're homemade! If you’ve been down Wellington Street in Hintonburg over the last nine months or so, it’s safe to assume you noticed the large bright purple painted facade with yellow lettering announcing the arrival of a new café. The former location of the subdued Levonian Shirt Maker shop had become a bit of an eyesore. On the other hand, the sign did an excellent job of grabbing attention and making a statement, too. It seemed to scream: Watch Out Hintonburg, Here I Come! At the end of April, the wall came down and Alpha Soul joined the neighbourhood. More than a café, it’s billed as a wine bar and an art space too. The outrageous colour palate remains — yellow walls and purple chairs create an overly caffeinated effect. But beneath its brusque exterior, there’s a warmth to the place with all of its homey baked goods, freshly brewed iced tea (lemon or mint! ), and even turkey pot pie. While it’s all a bit eclectic for my taste, I respect the desire to create a unique social gathering space in a city starved for something like this. The lunch menu, written across a couple of blackboards, is probably evolving too. It consists of the expected array of cold sandwiches made with Art Is In’s Dynamite baguettes; several soups; salads; and a couple of savoury pies. But when I dropped by last week, there was a surprise up there, too: sliders! Sliders are miniature burgers — a fading food craze and crowd-pleasing favourite at catered affairs. 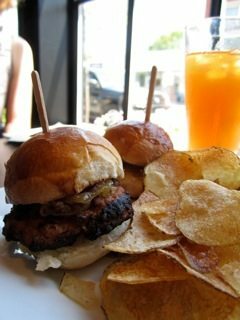 What’s nice about the way Alpha Soul sells them is that you can order individual sliders (about four bites worth of burger at three bucks a pop), served with lovely homemade potato chips. There are three varieties to choose from: a chicken burger with mango chutney, a pork burger with onions and barbecue sauce, and a spicy curry burger. I decided to go for a duo of sliders and pair them with a bowl of gazpacho. The fresh chilled vegetable soup had a lot going for it but two key problems: an overload of salt (which counteracted its thirst-quenching quality) and the critical omission of stale bread to give the soup better body and differentiate it from a bowl of salsa. It made a more satisfying dip for the potato chips than it was as an entrée. The sliders, both pork and chicken, were tasty, cooked through but not dried out with a nicely charred exterior. The adorable mini burger buns were fresh and the condiments were pleasantly punchy with a sweetness that complemented the well-seasoned meat. I also enjoyed a good long espresso and a lime melt (citrus flecked shortbread) before heading back out into the summer heat. I was sated, but not stuffed. I’m still not sure what to expect from Alpha Soul, but I am curious to see how it evolves. Alpha Soul Café, 1015 Wellington St., 613-761-8000.